It’s time for this month’s book reviews and boy, do I have some good ones for you! Some of these books are linked with affiliate links. You can learn more on our disclosure page. Homemade for Sale – How to Set Up and Market a Food Business from Your Home Kitchen by Lisa Kivirist and JohnD. Ivanko was super interesting. I’m not looking to set up a home based food business but some of you might be so when I found out that I could review and host a giveaway for this book, I jumped on it. And guess what, I learned some things that I can apply to our Etsy business. The first part of the book goes over Cottage Law – what it is, what states have it and how to find out if your state does and what exactly your state’s law allows. Sprinkled throughout the book are profiles of people cooking from their home and adding to their family’s income. Some of these business owners grown so much they are no longer considered “cottage” businesses and others have intentionally stayed small. I like that diversity in the profiles. There are also a sections on marketing (this is where I found many gold nuggets that were no specific to the food industry), product developement, finding your niche, setting up your business legally and keeping track of finances. The section is on making the leap from a cottage business to a small business. Under cottage law, your business can only make a certain amount of money. After that you are governed by small business law and not cottage law. There are many reasons for this but sometimes people get stuck. They want to grow but are afraid to leave the comfort (and lack of regulation) under cottage law. It’s a shame. So, I was really glad to see Homemade for Sale tackle this issue and encourage people to grow it that is what they want to do. The giveaway form is at the bottom of this post. The Beginners’ Book of Essential Oils by Christine J. Dalziel is a wonderful beginner book for essential oil users. There seems to be two main essential oil camps these days. One camp is the “Essential oils are effective to treat anything with no side affects.” The other is the “Essential oils are dangerous and you might do irreputable harm to someone by using them.” Both camps drive me crazy. I’m more a middle of the road but lean towards caution kind of girl. Chris is that same kind of girl. Instead of just writing a book of recipes, she talks about each of her top ten essential oils. For each of the oils she gives a little background on the oil, lists what it’s known for, and then gives you some ideas for using it. If there is something that you need to cautious about, she lists that too. The oils include lavender, lemon, peppermint, tea tree, rosemary, eucalyptus, majoram, geranium and rose geranium, frankincense and myrrh. At the end of the book are some body care and household recipes. Christine does a great job of making essential oil use simple instead of overwhelming. This is a book I wish I had years ago when I first started using essential oils. 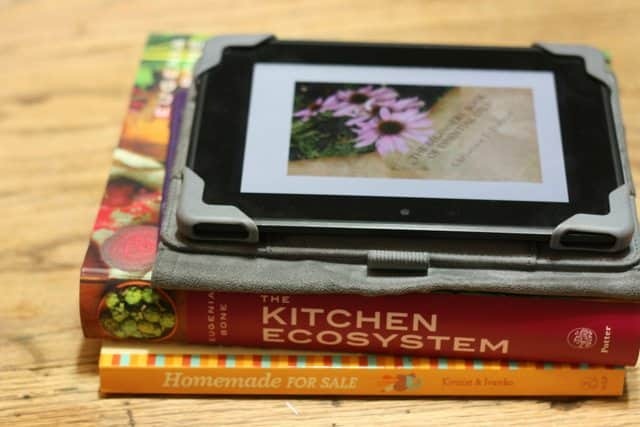 When I first came across Blogging for Books, I knew I wanted to request The Kitchen Ecosytem by Eugenia Bone to review. The concept is to begin seeing your kitchen as an ecosystem where meals build upon each other, instead of a series of individual, self-contianed meals. This intrigues me because that how I look at my kitchen, I just don’t use the word ecosystem to describe it. Rarely do I think about just one meal at a time. When we have a baked potato bar on Sunday, I always cook extra potatoes to use in eggs the next morning. When I cook chicken, I put all the bones in the crockpot with water and vegetable scraps to make broth to use in rice or soup later. The author covers 44 different foods and includes ideas on using them fresh, preserving some, using the preserves and (my favorite) using the scraps. This is great because how many times have you (or someone you know) gone to the trouble of preserving food and then not using it? That has happened to us a time or two. I didn’t count them all, but I’m guessing there is about 400 recipes in this book! Some of the recipes are simple like limoncella and others are a little more upscale like eggs poached on sweet peppers and onions. All of them look amazing. Yep, there are beautiful photos of many of the recipes. The book is organized by food, so all the tomato recipes are together and all the lemon ones are together. An incredible amount of thought went into this book and it is really easy to use. This is definitely a book I think you should check out from the library and see how often you re-check it. 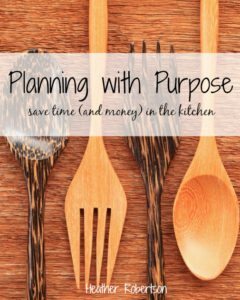 I really like Planning with Purpose by Heather Robertson. It’s not a cookbook, in fact there isn’t one recipe in it. It’s all about getting organized in the kitchen. Here’s the deal, if you want to feed your family real food on a daily basis, you can’t wing it. You have to plan ahead. That planning ahead is going to look different for each of us, because our families are different. At this point in my life, I don’t need a written menu of what we’re having for each meal. Why? Because we keep a stocked pantry and freezer, eat from our garden and rotate the same kind of meals each week. It’s all I can do right now and it’s boring. But it’s also planned. If you don’t have a kitchen and meal plan or you struggle to figure out a system that will work for you, you should consider getting Planning with Purpose and let Heather walk you through developing your own plan. Lately I haven’t been reading many books except the Bible. When I have time I enjoy reading books on gardening, herbs, and reading fictional books with a purpose with our children and also biographies of Christians in the past and martyrs. Thanks for hosting this giveaway! I would love this book, people tell me all the time I need to sell all the goodies I bring into work to share! I’ve just started reading The Bloodletter’s Daughter (Linda Lafferty). I’d love to have this book as a gift for a friend that is starting to sell jams, jellies and breads. Thanks for the opportunity! I’ve been reading a book on Mediterranean gardening that I just got. It’s very good for those of us in drought conditions. Just finished an informative book called Small-scale Livestock Farming by Carol Ekarius. Thanks for mentioning the book on Essential Oils. I am new to them and could use some help! alternating with some relaxing cozy mysteries. I have been reading (in addition to the Bible) the Jack Reacher series of fiction. My husband got me started on them 🙂 I have been having health struggles, so it’s kind of nice to read during the day to relax. I’ve also been reading books from the Ultimate Homemaking Bundle – right now I’m working on Paperless Home Organization by Mystie Winckler. I just talked with Christine and she’s working on a print version that will be release sometime this summer. I’ll try to remember to update this post when it does. 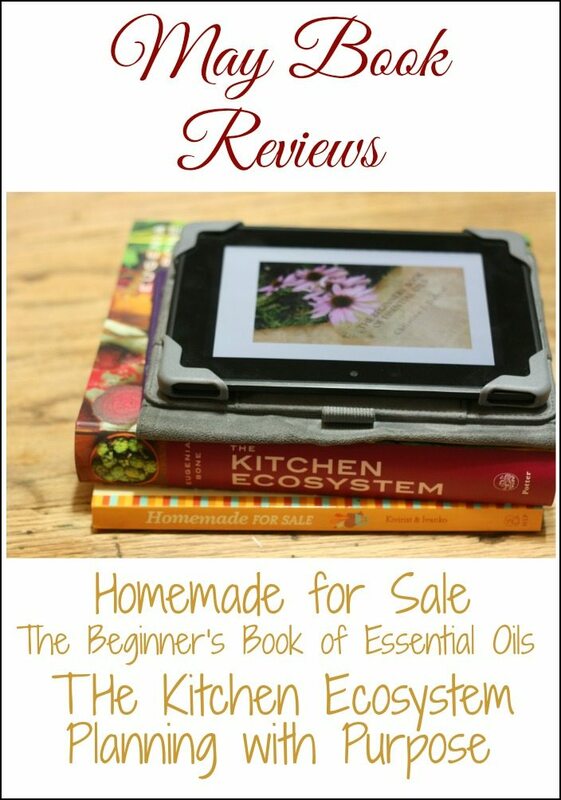 However, you might consider subscribing to her blog as I’m sure she’ll send out an announcement when the print edition is available, http://www.schneiderpeeps.com/homemade-for-sale-essential-oils-for-beginners-and-other-book-reviews-plus-a-giveaway/. Hi Ellen, The Essential Oils for Beginner’s book is now in print. You can find it here, http://amzn.to/1SJA8B1. Would love win this book… I will soon have more time for reading as it looks like I will be having a tolal. We have a spring / summer farmer’s market in Lodi, CA and I hope to start selling next year after I do some studying & research on what I can make that would interest buyers. I already started potting up cuttings from my succulent collection, crafting “bread & butter” items & bottling vanilla.extract. I’m determined to have additional income to help my son who lost his wife to cancer In March. He also lost his house & photography business to hospital expenses. He & his three wonderful teenage daughters are getting through their grief by keeping busy at home & in their church. Thank you for the book reviews. A couple are now on my wish list. I have been reading Praying with Paul for a small group Bible study. I have learned a lot from it. I have been reading the latest issue of Mother Earth News, as well as Kindle books on preserving food. Thank you for the opportunity to win this awesome book! Lately I’ve been donating a lot of older saved paperbacks from my bookshelves, but currently am reading a birthday gift, a new release, THE VAGRANT by Peter Newman. It’s a post apocalypse with a bit of hope. I’d like to win this book because I’ve always wanted to sell things I made but hesitated because I didn’t know the laws. This is the first day of summer break, so I am looking forward to my fiction pile, but I also love learning (hence the teaching degree…hope I can rub of on the kiddos! )…so, there will be plenty of non fiction about how to do “life” better! I had been reading a lot of health books, but I decided it was time to take a break from that and now I’m rereading the Game of Thrones series. I have been waiting for Christine D. to publish a hard copy of her book on essential oils. I love following her Facebook page. She’s wonderful isn’t she? I’m hoping the hard copy will be out this summer and I’ll be sure to share when it is. It’s on my list to add to our library as well.